The new animated film Big Hero 6 uses a new rendering system developed at Disney Animation Studios that simulates the effect of light on surfaces with much more subtlety and nuance than in previous CGI animated films. The rendering system, called Hyperion, manages the huge computational volume required for ray tracing. In a ray-traced image, the graphics system tracks the behavior of light rays that interact with various kinds of surfaces before passing through the picture plane. Any given light ray may bounce as many as 10 times, creating all sorts of secondary shadows, reflected light, or subsurface scattering. The inflatable robot character called Baymax is a perfect proof-of-concept for the rendering system because of all the internal scattering inside the vinyl skin. Although the designers could have used this system for a photo-real image, they were very conscious of keeping to the stylized character of the animated world. 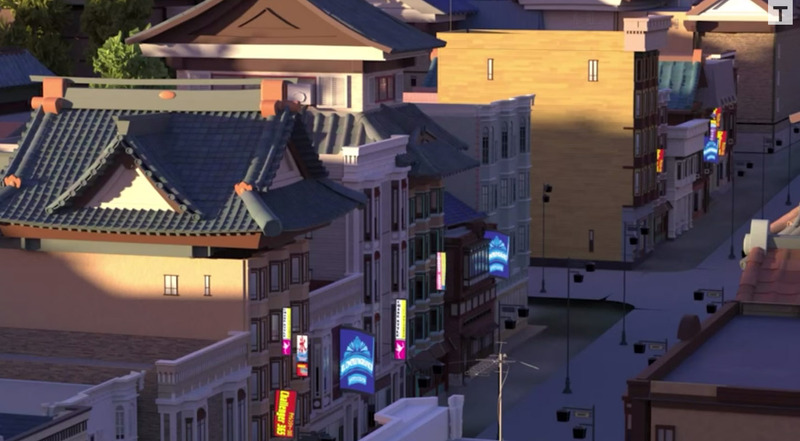 The film is set in an alternate universe of "San Fransokyo." It not only had to combine design elements of east and west, but also had to be extremely detailed and layered to allow for some fly-through sequences. The geometry was connected to an actual street grid of San Francisco, and the assets can be reused for future films and games. Both the rendering software and the architectural generator put immense demands on the Disney supercomputers. Tech supervisor Andy Hendrickson said "This movie is more computationally complex than our last three movies combined." In this video, Norm from Tested interviews Mr. Hendrickson about the techniques and challenges. (link to video). Speaking of animation, I'll be a speaker at CTN Animation Expo at Burbank in less than two weeks, giving presentations about Color and Light and Imaginative Realism. Hope to meet you there. James, I was very excited to see that you'll be at CTN! I'll be a second-year attendee, but this year I will be showcasing my character/prop design portfolio for the first time. Your blog and two books have all been a great help to me during my art studies, and I look forward to the opportunity to thank you for that in person. Does "photo-real" even apply to trying to create a convincing illusion of 3D space, considering the amount of idiosyncrasies and distortion in photos? There is something about the term that raises my hackles when I see or hear it. Maybe I'm too pedantic about it, but I'd imagine achieving photorealism would be bad for CG films and video games. It also bugs me that the term is meant to mean the highest degree of realism possible, when photography still falls short in picking up color nuance and proper value relationships (you can often tell a photographic image because a blue daylight sky will be darker than light colored objects in the foreground). Please tell me I'm over analyzing the usage of the term, James, so I can stop gritting my teeth every time I see it. I know you of all people understand the nuances of visual imagery, natural and manufactured, so don't take this as a criticism of your usage of the term in this article. Gurney, I'm from Brazil, a friend and I gathered money and bought his book at a time, cost the equivalent of $ 50 UR, could never imagine that cultural best investment I could have made! His book is by far the most magnificent I've read, one Dinotopia land of fantasy, and mysteries, perfect book, I had to learn English to read your book, put wire very well done, as you can see my English is limited, but its book is easy to understand! I would read other books in the saga, but companies of my country in the offer, ever thought of doing a deal with a major publisher in my country? I have no doubt that his book would be extremely ordered by intellectuals, or aspiring to it, hahaha, try talking to a publisher or other April, good luck, have a lot of growing yet! I hope soon to read more of his books, ae one more, the movie inspired by his book, in my country was a total success, yet thousands of people wanting to buy it and many others who want to read the book that gave rise the movie made my childhood, and has completely changed, thanks for everything. Chris, don't gnash your teeth! There are really many styles of photographic effects that can be achieved in CGI, simulating all sorts of lens phenomena, film foibles, or digital sensor anomalies. It's not the ultimate or only reality, and it's often far different from realism based on the foibles of human visual perception. Often the lensed look is what a live action VFX team is looking for to make the CGI match up with the plate photography. The whole point I was making is that Disney's rendering system could be used for such a look, but the artists on this film are going for another sort of reality, matching up with the director's vision of a sort of heightened realism possible in animation. Ana, thank you for your message! I am so impressed that you learned English to read my book. Thank you for making the effort to read it. The book was published in 18 languages in 32 countries, but unfortunately it's not still available everywhere. Gina, thanks for that! I'll be looking for you at CTN.